Advanced urology is proud to offer advanced prostate cancer patients PROVENGE® (sipuleucel-T), the only personalized treatment that is clinically proven to extend life in certain men with advanced prostate cancer. 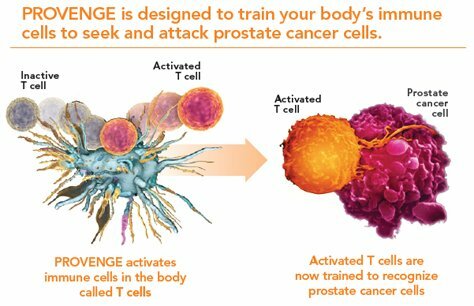 PROVENGE is an immunotherapy that takes your own immune cells and reprograms them to target and attack your prostate cancer. PROVENGE® (sipuleucel-T) is approved by the FDA as an autologous cellular immunotherapy for the treatment of asymptomatic or minimally symptomatic metastatic castrate resistant (hormone refractory) prostate cancer. PROVENGE is a treatment option for men with asymptomatic or minimally symptomatic metastatic castrate resistant (hormone refractory) prostate cancer. PROVENGE is designed to use your immune system to fight prostate cancer. Your immune system is made up of immune cells found in your blood. These cells work as your body’s natural defense against all types of illness, including prostate cancer. Your personalized dose of PROVENGE consists of your own immune cells that have been activated with a recombinant antigen to seek and attack prostate cancer cells. By stimulating the natural ability of immune cells already in your blood, PROVENGE may help you live longer. Even though your immune system works to defend you against infection and disease, sometimes cancer cells can “hide” from your immune system. PROVENGE is the only FDA-approved prostate cancer immunotherapy. It is the first in a new class of therapy to use this approach. What Are the Benefits I Might Receive From PROVENGE? PROVENGE is an exciting innovation in the treatment of advanced prostate cancer. The prostate-specific antigen (PSA) test is often used to monitor progression of prostate cancer and how effective your treatment may be at controlling it. It is important to note that changes in PSA levels may not be a good sign of whether you are benefitting from treatment with PROVENGE. Even if your PSA levels don’t change, PROVENGE may still be working.